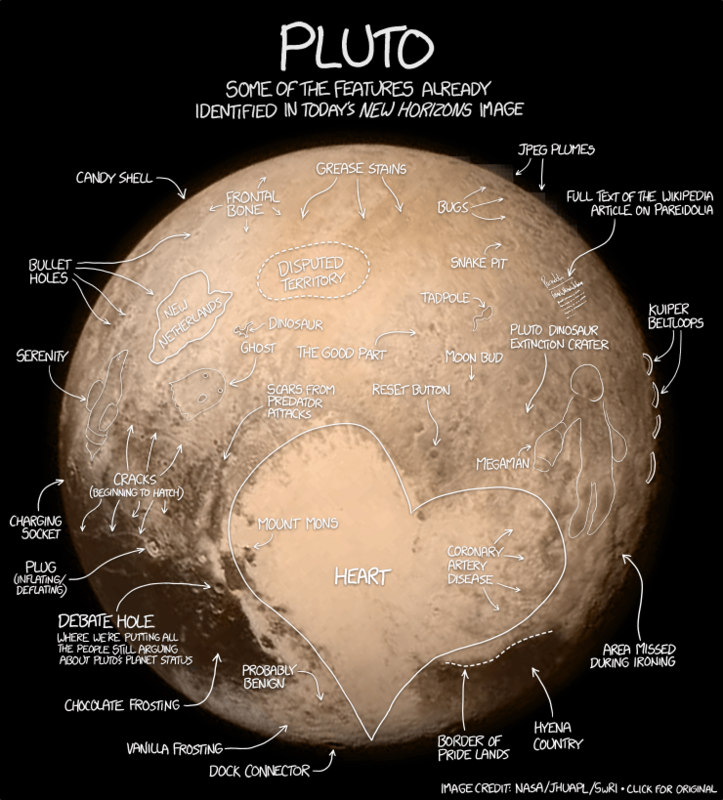 The very clever folks at XKCD have put together this map, highlighting some of the features scientists have already identified on the Plutonian surface! Latest image of Pluto, courtesy of New Scientist! ABC Australia has created a very cool image montage of New Horizons’ approach to Pluto. See it here. 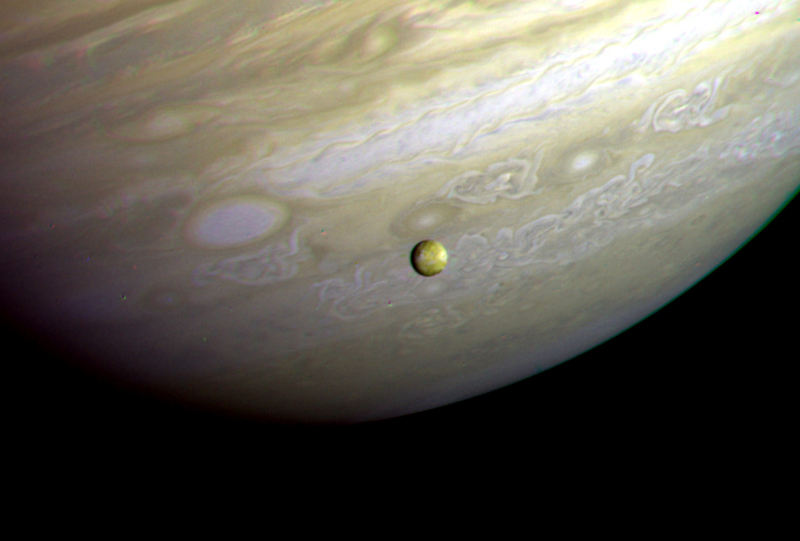 Jupiter and Io photographed by the Voyager 2 probe on 9 July 1979. 1979: Voyager 2 made its closest approach to Jupiter on this day, passing within 570,000km of the giant planet’s upper atmosphere. The twin Voyager spacecraft made numerous discoveries in the Jovian system, including active volcanoes on the moon Io (the first discovered beyond Earth), faint rings encircling the planet and previously unknown moons. Here’s Pluto Like You’ve Never Seen It Before! Great photo and post by Jason Major of the Lights in the Dark blog. …no, really. There hasn’t been an image this detailed of Pluto and its moon Charon in pretty much EVER. (Which makes total sense since New Horizons is the FIRST spacecraft to visit it and it has less than a week and .05 AU to go until its closest pass!) 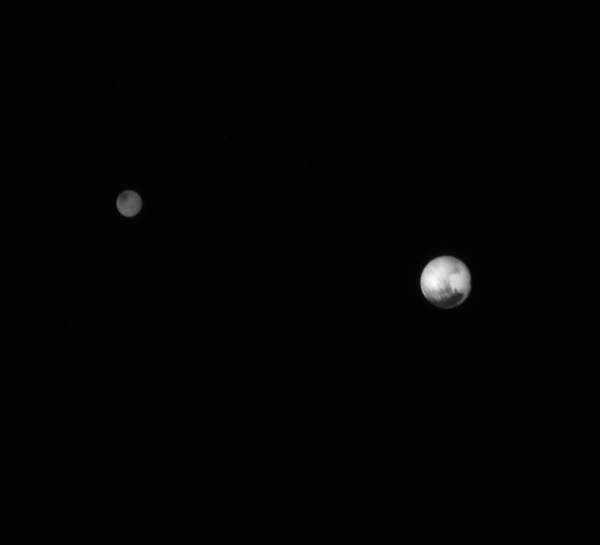 So actually everything you’ll see of Pluto and Charon from now on will be like never before. This brilliant time-lapse video chronicles the Mars Opportunity rover’s first 11 years of service to science! ‘Opportunity’ and its sibling ‘Spirit‘ touched down on Mars in January 2004 with a planned 90-sol (about 92 Earth days) mission. Spirit fell silent in 2010 after becoming stuck in soft soil 10 months prior. Opportunity has exceeded its original mission duration by 40 times, and is still carrying on. The Energizer Bunny wishes it was Opportunity! These are the most recent high-resolution views of Pluto sent by NASA’s New Horizons spacecraft, including one showing the four mysterious dark spots on Pluto that have captured the imagination of the world. 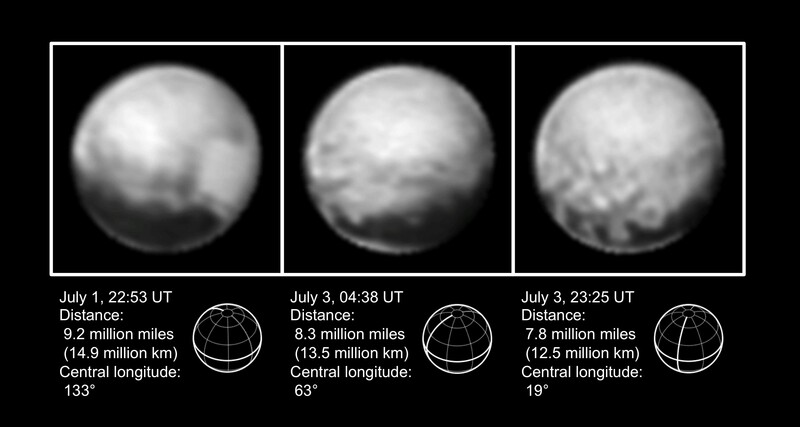 The Long Range Reconnaissance Imager (LORRI) obtained these three images between July 1 and 3 of 2015, prior to the July 4 anomaly that sent New Horizons into safe mode. The left image shows, on the right side of the disk, a large bright area on the hemisphere of Pluto that will be seen in close-up by New Horizons on July 14. The three images together show the full extent of a continuous swath of dark terrain that wraps around much of Pluto’s equatorial region. The western end of the swath (right image) breaks up into a series of striking dark regularly-spaced spots, each hundreds of miles in size, which were first detected in New Horizons images taken in late June. Intriguing details are beginning to emerge in the bright material north of the dark region, in particular a series of bright and dark patches that are conspicuous just below the center of the disk in the right image. 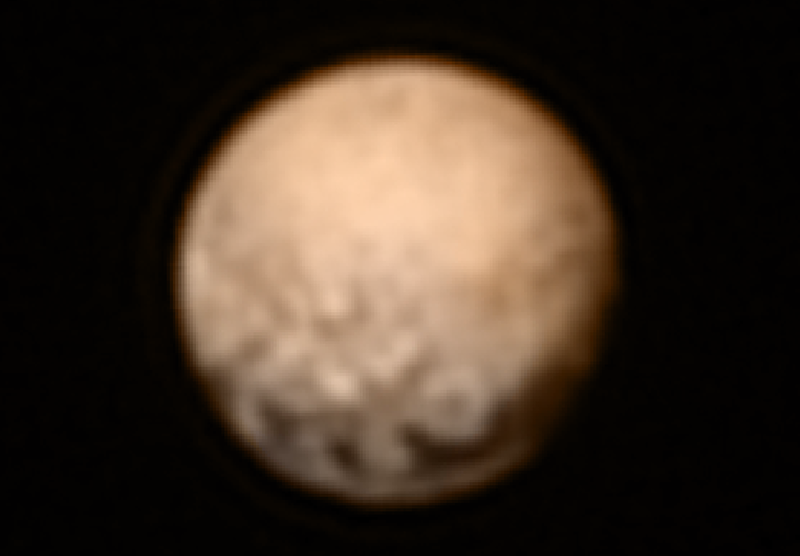 In all three black-and-white views, the apparent jagged bottom edge of Pluto is the result of image processing. The inset shows Pluto’s orientation, illustrating its north pole, equator, and central meridian running from pole to pole. The color version of the July 3 LORRI image was created by adding color data from the Ralph instrument gathered earlier in the mission. New Horizons mission control in Maryland, US, experienced a loss of communications with the spacecraft beginning at 1654hrs UTC on Saturday, 4 July, and lasting about 80 minutes. The spacecraft’s autopilot went into ‘safe mode’ and commanded the back-up computer to re-initiate communications with Earth. New Horizons is presently around 4.4 light-hours from Earth, so the spacecraft had undertaken the steps to re-establish communication three hours before the initial break in the signal had even reached Earth. Mission control are investigating and have promised more information as it becomes available.